In 1781, the German-English astronomer William Herschel sent shockwaves through the world of science when he discovered the planet Uranus. Since humans began observing the stars, the general consensus was that there were only five other planets in addition to the earth orbiting our sun. That there could be sixth planet in the heavens was almost unthinkable. 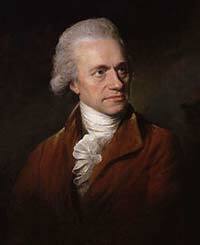 William Herschel was born in Germany in 1738 (as Friedrich Wilhelm Herschel), but spent just about all of this adult life in England. From a very early age, people noticed his intelligence. His father, Isaac Herschel, was an oboist in a military band, and young William displayed an amazing natural talent for music. He quickly mastered the violin, harpsichord, and organ. He also began composing classical music of extraordinary quality. As Herschel grew into his teens, he began to show that he could master any intellectual challenge. He demonstrated that he could learn other languages with ease. A native German speaker, he quickly learned English, French, and Italian. He also absorbed Latin and Greek, and he could also read and write in both languages. In his early 20s, Herschel moved to Sunderland, England, where he landed the prestigious “first violinist” position for the Newcastle Orchestra. Herschel’s enormous talent both with writing and performing music boosted him to the top tier of English society, living and working mostly in Bath. Herschel was deeply interested in the theory of music as well. This led him to a fascination with mathematics. A meeting with British Royal Astronomer Nevil Maskelyne would bring him to his true life’s passion – building telescopes and observing the heavens. Once Herschel began studying astronomy, it became an obsession to him. In his house in England, Herschel began grinding lenses to construct small reflecting telescopes, those that use mirrors rather than a lens as the primary light-gathering element. These are known as Newtonian telescopes because they were originally designed by the Isaac Newton. Starting with small 6- to 8-inch reflecting mirrors, Herschel was driven to build bigger mirrors with increasing light-gathering power. Herschel once said that his goal was to “see deeper into space than any other man.” Eventually he did. Herschel’s hand-made telescopes – which were certainly the finest in Europe – grew ever larger, culminating with his behemoth 40-inch mirror reflector which would be the largest telescope in the world for years to come. In addition to discovering the planet Uranus, Herschel was among the first to catalog deep space. Based on thousands of observations made over several decades, he was the first to construct, or at least attempt to determine, the shape of the galaxy by showing where and how stars are distributed throughout space. He is also credited with discovering infrared solar radiation, among other accomplishments. Herschel’s talents as an observational astronomer, a theoretician, a telescope maker and an accomplished musician brought him fame and renown. King George of England frequently invited him to personal meetings and provided him with generous financial support. Despite his fame, status and genius, Herschel was well-known to be extremely charming, kind, personable and even a humble man. He continued to be involved with music throughout his career as an astronomer. He died at age 83 in 1822 in Slough, England, where he had lived for many years. His only son, John Herschel, went on to become an astronomer and scientist of great skill. His devoted sister and lifetime observational assistant, Caroline Herschel, also became an accomplished astronomer in her own right.